Johann Nicholas Barrick "My Patriot" was born on August 2, 1761 in Greenwich, Pennsylvania. He married Anna Maria Lambert ( Lambertie) variations in 1783. They had four children in 23 years. He died on July 20, 1844 in Cumberland County, Pennsylvania, having lived a long life of 82 years. As you can see, my Patriot is from Pennsylvania. I was born and raised in Pennsylvania so it was only natural for me to make my final decision to choose a Chapter in Pennsylvania. Mother and Daughter - We joined together! 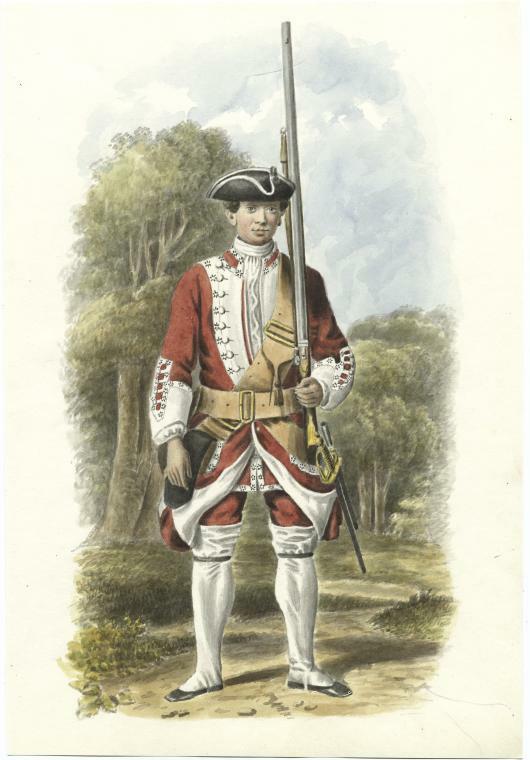 5th Great Grandfather Nicholas Barrick. Grandfather Nicholas served with the 6th Battalion of Berks County, Pa Militia. He was mustered in for the Revolutionary War. He received a pension from 1837- until his death in 1844. When the Revolutionary War was over, he was deeded land from his Father Henry who we see has having the last name of Berg. He shared this land with his brother John in Pennsylvania. The family ended up moving to Queen Annes County in Maryland about 1790 where Nicholas worked as a bricklayer on the new courthouse. 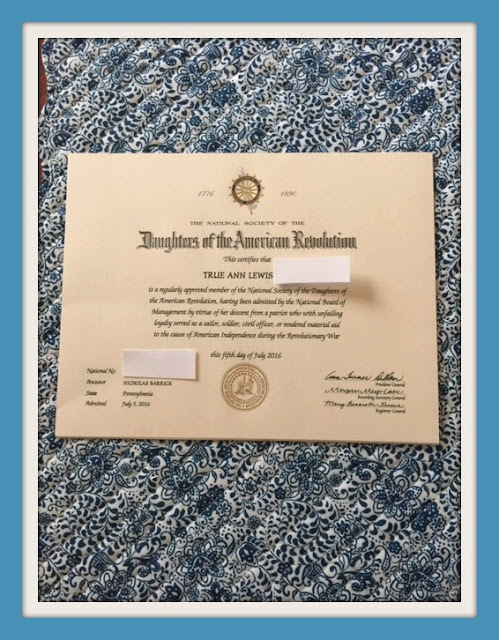 It took me four years to order and research, to get my Application for the DAR completed. It was well worth the Fight! It was quite the experience with this type of lineage research gaining and ordering sources and proving connections generation to generation and how it's suppose to be done correctly. It took every ounce of my belief and others that this could be possible. I want to Thank some very patient Genealogy Friends along the way who encouraged me and had my back along the way. Even when I was pouting and throwing my hands up at a few turns. They kept me encouraged. There was even a "Group" made for me to go back and forth on theories and have a workstation, just for me to concentrate solely on my application and get moral support. There was a Mondays with Myrt! program I had attended from Dear Myrtle. All this came about because I yelled out of place in our Chat Room and my hand went up like a school girl who couldn't wait to be answered from the teacher! We were having a discussion and somehow DAR came up. Cousin Russ and Dear Myrtle said "Who was that?" and her light bulb went off! That is how the ball got rolling! With her weekly Wacky Wednesday she took time and patience with Cousin Russ to have a Hangout designed around me and my Patriot. She gathered all the resources she had available and got me surrounded with a Group of Ladies that went well beyond the "Call of Duty", like Soldiers do. They had a plan. I was introduced to Marian Kowalski and Sheri B. Fenley along with Carmen Cross and Brenda Hare. Their work was impeccable. They had all my Documents lined up and advised me on, what do you do next? They were my 2nd pair of eyes with glasses. For one, I had approached my application in the wrong way. DAR research is different from tree building. Collaboration at it's best! The Genealogy Community came out for one of it's own. 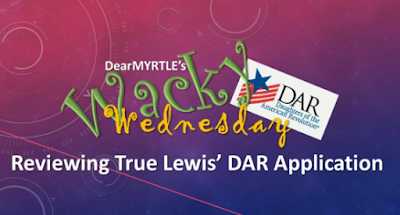 By the time Dear Myrtle and her Community got through with me I had a completed DAR worksheet with all that I had researched and saw where my 3 weakest links where to work on so I could continue to the home stretch. In February, 2016 after Rootstech I was able to Submit my Application to my Registrar. On April 25th, 2016. The Letter I was waiting on came with the news I needed more Documentation. Hard lessons to learn and more research. 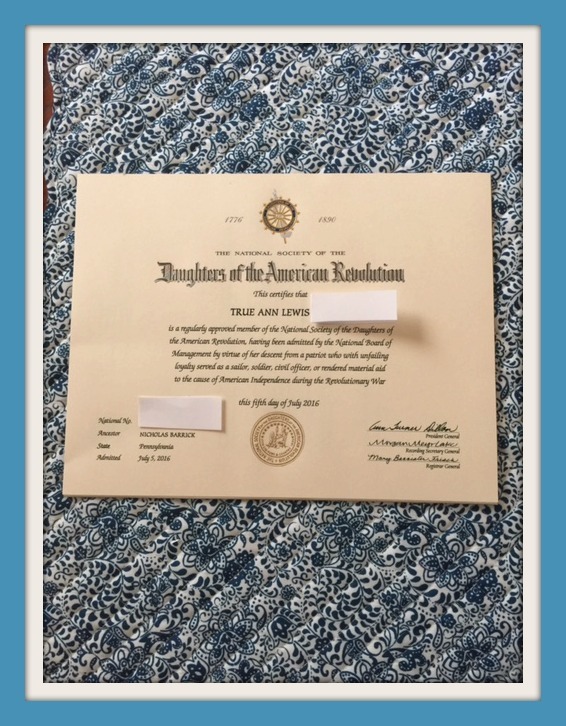 I am now as of July 5th, 2016 a Member of the National Society Daughters of the American Revolution. Without you all keeping me uplifted, encouraged and beating the drum on this Application. I wouldn't of got through this all. I wanted you to know I appreciate all the work and effort you put into this Special Project just for me and my Mom. All your hard work didn't go unnoticed. It's not unbelievable how far and wide you put your arms around me and got me through this Journey. All the support from the Genealogy Community as well. I wanted to thank you with much gratitude and I know my Patriot Grandpa Nicholas is saying Thank You for helping their Grand baby out as well. I Salute you. I Thank you. It's with Gratitude I'm writing to you, from my Heart that I'll always remember and this will be my words for all to see for future Generations. Thank You for being on this Journey with me. The Great Great Great Great Great Granddaughter of Patriot Johann Nicholas Barrick. Dedicating this to my Fellow Sisters: Shelley Murphy. Elon Cook & Karen Batchelor the 1st African American Woman recognized admitted to the DAR along with our Brothers Lonnie Riley & Michael N. Henderson of the Sons of the American Revolution. 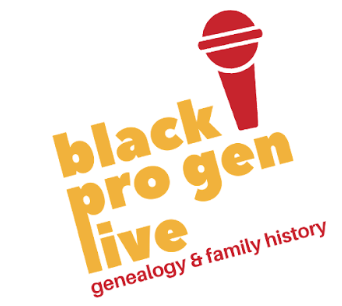 Also, My Black Pro Gen Family. You have been supportive in so many ways on my Quest to get this Completed. All is Well. Thank You from my heart. This is for you Pudding and the rest of my Future Grand Babies, Nannie did this all for you. The Lest of roads Traveled. Many have Journeyed before me. Many will come after me. I Stand here to tell you, you can take this walk and Reclaim your Lineage as well. Let your Presence be felt. For you are Today's DAR. 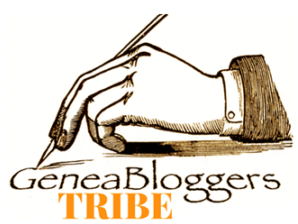 Why should you Join a Lineage Society? Labels: Black Pro Gen. Notes To Myself. My True Roots. Ike Ivery., DAR, Daughters of the American Revolution. Nicholaus Barrick., Genealogy.